he focus here is on established pioneers, as well as the many new small domaines now placing Languedoc-Roussillon solidly on the country’s quality wine map. Although many appellations here are of long standing only recently have widespread improvements been made in the standard of the wines. 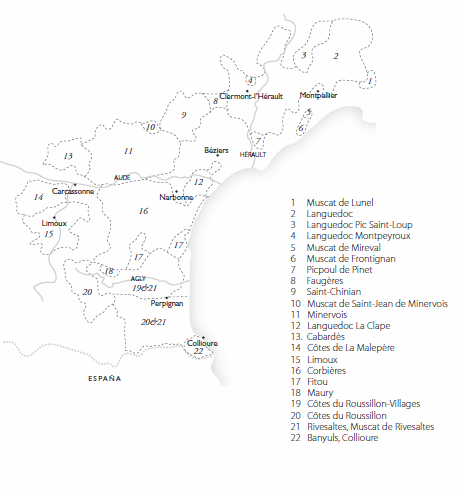 While many high quality domaines are emerging, in the Languedoc in particular many of the wines are over-extracted. There are fewer new names in the Roussillon but these have been producing wines of a uniformly impressive quality. Many vineyards originally used for fortifieds are now providing some great reds in particular. While prices generally remain very fair some are creeping up significantly. The transformation here is unique in France.